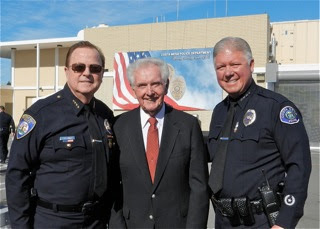 As some know, former Costa Mesa Police Chief Roger Neth received word this week that he will be among several alumni to be inducted into the Newport Harbor High School Hall Of Fame later this year. Bradley Zint wrote a nice article in the Daily Pilot about that announcement HERE. Well, Chief Neth is on a roll. 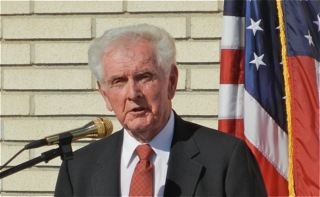 At the abbreviated City Council meeting on Tuesday, February 2, 2016, he will receive the Mayor's Award from Mayor Steve Mensinger. While it's wonderful that Chief Roger Neth, shown below with former chiefs Dave Snowden and Tom Gazsi, will be recognized by The Mayor on Tuesday, it's too bad that this ceremony will occur at a meeting that will likely be sparsely attended due to the limited agenda - there's only one item on it. I hope you all will join Chief Neth's friends when he receives this honor. The meeting begins at 5:45 in City Council Chambers and his award will occur promptly at the beginning of the meeting. See you there. A good friend who's in the know sent me a note to correct the A.B.L.E. record, above. My friend tells me that Chief Neth started the Costa Mesa helicopter program in 1970 and was actually a pilot in that program. He tells me that Costa Mesa took delivery of the first helicopter a couple months after Huntington Beach acquired theirs. He tells me that Chief Neth was instrumental in leading edge technology and put computers in the police cars decades ahead of the other agencies. He tells me that Costa Mesa also had the leading edge communications center that other agencies throughout the nation would visit. 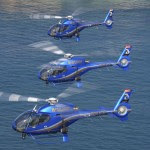 Although he was the father of the Costa Mesa helicopter program, he retired before the formation of A.B.L.E. I'm told that A.B.L.E. 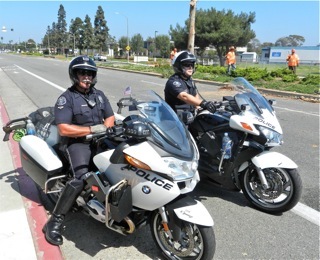 was a Joint Powers Agreement between the Newport Beach Police Department (Chief McDonell) and the Costa Mesa Police Department (Chief Snowden). It was formalized in 1996 and continued to operate as an effective, efficient air support model serving three communities - Santa Ana contracted with A.B.L.E - until the short-sightedness of the Costa Mesa City Council folded it up on June 30, 2011, HERE, and HERE. Thanks to my friend for the clarification and amplification of this issue. I do not want to muddy up the Roger Neth Mayor's Award. But I can't allow the false claims and misleading information by the Mayor, Rob Dickson and others go unchallenged regarding a recent post I was made aware. Here is the misleading and false post from the Mayor. "When I authored COIN in the back of my mind I kept thinking of Councilmember Leece and Foley and their dedication to the Unions. In 2008 in a late night session both of these Council Members retroactively increased pensions without the public knowing. That vote cost the taxpayers 16 million dollars with a swipe of the pen." Misleading comment number 1) The vote was cast at around 2.30.00 into the meeting. There was a slight delay according to Mayor Bever to the start of the meeting. Unless the delay was was actually in the hours that would make the vote probably around 8:30pm not in a late night session. Not with the public unaware. This is a complete falsehood by Steve Mensinger. The entire meeting of May 20th 2008 took only 2 hours and 33 minutes. How can Mayor Steve Mensinger make the claims he does it was a late night session without the public knowing? Again if the meeting started 4 hours late then OK it was late night. But Mayor Bever stated is was a slight delay. Misleading number 2) the vote was not just Leece and Foley but it was a unanimous vote of 5-0. Including Mayor Bever and Allan Mansoor voting for. In fact Mayor Bever moved the motion and was praising CMCEA and it's employees for agreeing to pay for the increase. Yes Mayor Bever praised the employee group for their economic understanding of the cost and agreeing to pay for it. Mayor Pro Tem Mansoor also voted for the motion. Yet Steve Mensinger the current Mayor decides to deceive everyone regarding this voteand accuse Wendy Leece and Katrina Foley as if they are mostly responsible for this vote. The deciet stinks to high heaven by the Mayor no matter how you feel about the pensions and their costs. Falsehood number 3) The retroactive portion was clearly in the staff written report. Maybe not discussed during the meeting but clearly hashed at the meetings that took place with the Council. Also everyone should note that every previous pension increase had been retroactive. I believe it was inherent into the system by CalPers too. It is simply false to imply this was not known that the increase was retroactive. But of course Steve Mensinger and Rob Dickson apparently care nothing of truth and honesty. Falsehood 4) The staff written report clearly showed that the increase to the liability would be $4,000,000 dollars at that time. Not the false claims by the Mayor who states it was $16,000,000. I do believe that when the economy took a dive and CalPers had to ask the city for more that eventually years later the cost very well could have risen to $16,000,000. But for the Mayor to imply that the stroke of that pen at that time cost the tax payer $16,000,000 is a blatant falsehood. Sadly keep in mind the report numbers were produced by a CalPers expert and then backed up by the city's hired expert John Bartell. Your city employees, as praised by Mayor Bever, agreed to pay for what all were told would be the costs of the increase at that time and in good faith. Now people like Rob Dickson, Mayor Steve Mensinger and Gordon Bowley would like to cast negative aspersion upon those city employees. I think Rob Dickson instead of asking are city employees going to pay for the increase costs of the CalPers increase because of the economy crash, he should actually ask is the Liberal Current CouncilMAN on the take for the UNIONS who voted on both the 2000 Police 3@50 and the 2010 Fire 3@50, is he going to pay for those increased cost? Yes there is one current councilMAN who voted on both the evil police and fire 3@50 unsustainable pension increases. So how did he vote in 2000 and 2010? It would be interesting to know how that Liberal on the take of the Unions Current CouncilMAN voted on those issues. That would make him the only council member to vote on both the highest pension increases. What is truly sad about this is not that the Mayor and his pals mislead and tell false tales. It's that the Pension Oversight Committee (Jeff Arthur and his Committee) know and have all this information but will not correct the false claims. Take heed, Mr. Mayor, of what the first Republican President had to say: "You can fool all of the people some of the time, and you can fool some of the people all of the time, but you can't fool all of the people all of the time." Lies will catch up to you eventually, and you will be seen as what you really are. Eleanor Egan: I do believe Rig's lies are beginning to catch up with him.